What we learned from issue experts: Mapping and analytical needs. We worked with four issue experts who covered different and sometimes opposite aspects of the controversy: a climate change skepticism researcher at the University of Amsterdam, a carbon trader and a carbon trade watchdog. In the last session we invited a media organisation (the Guardian) to talk to us about how maps and visualisations are produced for the media. 1. The climate change skepticism researcher. We invited Sabine Niederer, who is writing her PhD dissertation on climate change skepticism. She is interested in questions such as: What is state of the art in climate change skepticism? Are the skeptics mainstream or fringe climate change scientists? And, how would one define the mainstream? These questions are addressed through the study of their resonance in scientific literature, on the Web and in Wikipedia. Niederer presented some of the findings and visualizations from her recent work. Firstly, we learned from her talk that skeptics are mainstream in the academic community, while they are not as prominent in significant climate change sources online. On the web there is a significant distance between the sources that mention them and the top of search engine results. Secondly, we learned that climate change skeptics are skeptical of other issues as well and act, in Niederer’s words, like professional skeptics. In the Issue Mapping for Politics course, it was termed the “Niederer twist.” Finally, there is the question of the coherence of climate change skepticism. Through her research it became evident how climate change skepticism can also be thought to be country specific. In terms of analytical needs, she was interested in further researching how climate change skepticism compares across countries, which is what our students took up in their projects, resulting in mappings of the Russian, German and Swedish web information spaces and the popularity of climate change skeptics in these spaces. Using the two mainstream search engines in Russia, Google.ru and Yandex, the students were able to map and describe also two different information spaces. For instance, using Google.ru the sources that most frequently mentioned the names of skeptic scientists were the urls of entertainment and news sites, while those using Yandex encountered instead that scientific and academic resources were those that were more likely to reference the skeptics. The mappings also helped to visualize which arguments were most often represented on Russian web sources. Here critiques to the Kyoto Protocol, as being ineffective and based on ‘bad science’, were most popular. One of the least frequent arguments was the belief that the greenhouse effect is natural and not manmade. These findings about the Russian web space were consistent with the results obtained using the Google search engine for Germany. The sources that privilege the skeptic scientists were also news-based. More in detail, it is possible to suggest that this is influenced by the animated debate taking place in Germany regarding the ‘energiewende’, which describes the change from nuclear energy to regenerative energies. Finally, when comparing these results with those obtained using the Google search engine for Sweden, two main differences were present. The frequency of mentions of climate change skeptics was lower in general; scientist advocating for climate change skepticism seemed to be less ‘popular’ in this webspace. Also, when they were indeed referenced it was mostly in pro-climate change websites. Ultimately, the work done by the students in this first stage of the course expanded on Niederer’s point on the ‘diversity’ that exists within the climate skepticism discourse and it provided some insights on what is considered ‘news-worthy’ on relation to the debate. 2. Climate change mitigation: The carbon trader. Our carbon trade representative is Walle Oppedijk, a consultant in the field of carbon trading. He explained to us how the market works, and who participates in it. When discussing the ‘issues’, he concentrated on the current ‘scandals’. These include stolen carbon credits, VAT fraud, recycled CERs (Certified Emission Reduction units), ‘carbon cowboys’, over-allocation, localized power markets and failing agreements post-Kyoto. Regardless of the nature of these issues, according to Oppedijk, carbon trading is a positive development and its failure is to be blamed on an ineffective market (decent price points to move the market). Good economic incentives and stabler (higher) prices would make the carbon market work. When confronted with the controversies regarding the negative impact of carbon trading on local communities, especially in the global south, Oppedijk responded that he was not aware of these critiques and reassured, in stark contrast to the carbon trade watchdog representative, that the ‘where’ does not matter, as long as carbon emissions are compensated. 3. Climate change mitigation: The carbon trade watchdog. “The carbon market is talked about as if it was the only option in town. This is the discourse they want to make you believe. Why not reduce emission at the source? No offsets. Making companies reduce their own emissions and not outsourcing them somewhere else. The solution is to make companies change their ways. Even more, the resources needed to import green materials are sometimes more pricey than what is actually saved” (quoted from her presentation). The carbon trade watchdog has mapping needs rather than analytical needs. 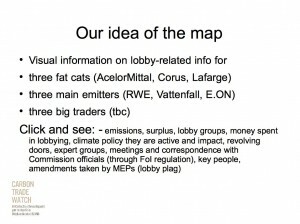 Their work revolves around generating awareness about alternatives to carbon trading and thus would like to have their message to be built into the map: a visual representation of lobbying-related information for major actors in the carbon trading field. Their understanding of mapping and of the type of findings that could be made using internet data, differed from ours. The carbon trade watchdogs wanted a tool that would help them illustrate their points and for us to augment a geographical map with the information that was already available to them. This is a valuable experience. Similar to how Oppedijk, our carbon trader, had a particular understanding of what the issues in his field were (scandals), the representatives for carbon trade watch had pre-established expectations of what the mapping were and the service they could provide. Slide taken from the presentation by Carbon Trade Watch. 4. 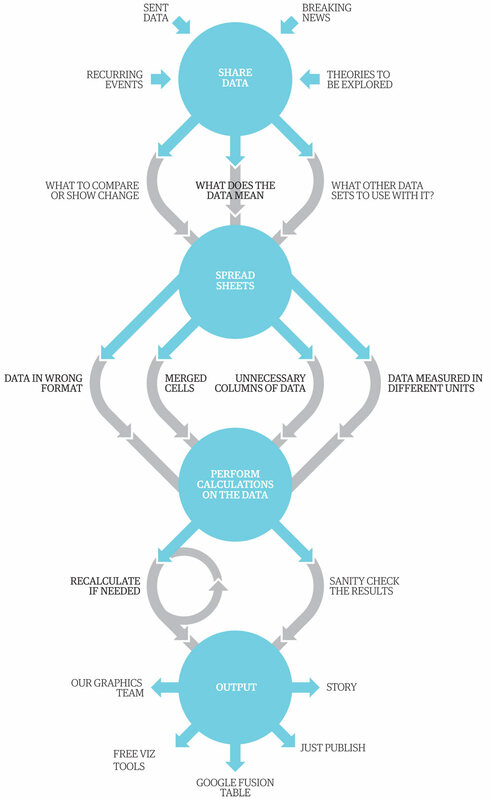 Climate change adaptation: The Guardian Datablog. For the last stage of the climate change controversy, adaptation, we invited the editor of the Guardian Datablog, Simon Rogers, to talk to us about how maps and visualisations are produced in the media. On the production side, one important question for us concerns the relationship between our mapping work (including the visualizations) and newsworthiness. We learned that one important criterion is a timeliness wherein most often stories and postings are published in response to breaking news, which is done very quickly (the data needs to be published within a few hours from the release of the news). The datablog journalists most often react to an official (governmental) claim or a societal rumour, and undertake fact-checking. Ultimately the focus is always on a story: “The most important thing is that we tell stories,” says Rogers. On the reception side, we learned that people spend on average 6 minutes on a Datablog graphic while Guardian articles garner on average 1 minute of people’s attention. According to Rogers, “flat visualisations (as opposed to interactive ones) do well because they can be shared and downloaded and because people read the news on their mobile devices.” Particularly bar charts and pie charts are a recommended graphical format in the media (although not necessary in the academic community, as MIT Press recommends against their use). Furthermore, according to Rogers, the data that does best is the data that can be compared to something people relate to. Graphics work best when they relate to people’s everyday life. Additionally, the Guardian also publishes data in a tabular format together with their articles or graphs. However, we learned that “most people won’t do anything with it,” according to Rogers. For those few who do, the Guardian maintains a Flickr group where people can post visualisations which they created using the Guardian’s data. Establishing a dialogue with issue experts: the workflow. Maps have different functions to issue experts (e.g. : vizualise relations and make findings; create awareness and make statements; be newsworthy). Maps circulate. Good maps can be shared easily (flat visualizations do better than interactives). Maps have audiences. What is relevant to map depends on the audience. For maps directed at a general audience (non-experts) a good strategy is to make them personal, so people can relate to them. Mapping projects may be double binds. The carbon trader has a blind spot concerning Southern issues. Carbon Trade Watch feels that the Southern issues are so well known that there is no need to have them mapped. It is important we understand what the issues experts think are issues. For example, for the carbon trader issues are scandals. Researchers and stakeholders have different views of the web: for Carbon Trade Watch it was a “click and see” web. They wanted their message built into and their datasets rendered on a map. To finalise the research projects that were inspired by the meetings with the issue experts, and compile them into a publication, students have worked on a book sprint. They are also encouraged to conduct outreach activities and communicate about their work once the publication is completed. This entry was posted by Amsterdam on Friday, May 17th, 2013 at 10:55 am. It is filed under climate change, Events, prototyping with users. You can follow any responses to this entry through the RSS 2.0 feed. You can leave a response, or trackback from your own site. © 2013 EMAPS | Powered by WordPress | Theme 'Sirup' by 1000ff | 36 queries 0.197 sec.